← A PQL love-in, and our very first contest winner! I just wanted to start this post by thanking everyone who entered our Alice’s Adventures in Wonderland contest ! I’m hoping to have more contests/interactive features with you through the next few months, so stay tuned to the blog, our facebook and twitter for all the details! We discussed book-related topics at length (don’t all gasp at once, I know that’s a huge surprise), pondering the future of print books and ebooks, book recommendations, upcoming PQL titles and other ways that we can get you all involved with what we do here – we want you to be as excited about our books as we are! In case you’re wondering, it wasn’t entirely “shop talk”— we also discussed UFC, which George said was unbearably noisy, but may have inspired a book (To which Michelle responded, aghast: “You’re not really thinking of doing a book of that, are you?) What do you think? Since I’m an incredibly lucky Porcupette (or perhaps because George and Michelle are awesome) our next stop was a tour of George’s studio, where he showed me how he makes his fantastic engravings! If you want a peek for yourself, check out this fun video that shows bookmaking at the Quill and George working on his mind-blowing engravings. George Walker – Printmaker from Marc Beurteaux on Vimeo. 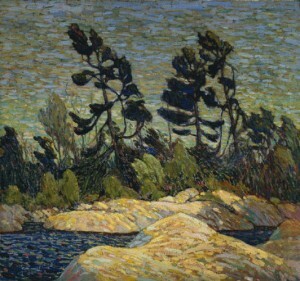 George also showed me some of the blocks and prints from The Mysterious Death of Tom Thomson, which we’re publishing in Spring 2012! I just started work on the tipsheet for Tom Thomson recently, so I felt incredibly privileged to see how it was all made! 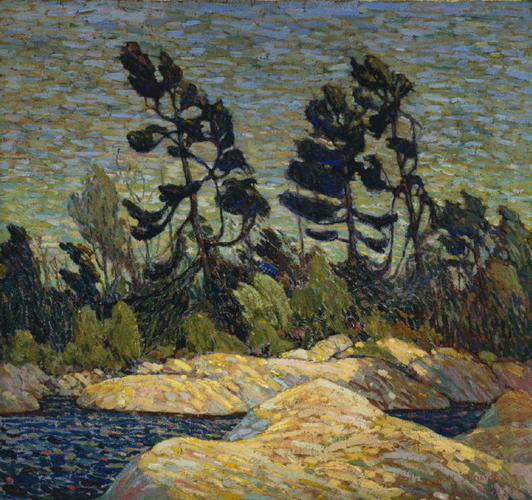 One of the neatest things was the block George engraved that was made from one of the trees in Tom Thomson’s painting Byng Inlet, Georgian Bay. There were shelves and shelves of his works, including an edition of Poe’s The Raven and his Woodcut Artist’s Handbook in a Polish translation, which are just a few things I had the chance to peek at! So quill friends, do you want to learn a little more about our very own George A. Walker? You’re in luck! The most recent issue of the Devil’s Artisan (#68) is all about his work, or if you’re in Toronto, you can come out to TCAF (Toronto Comic Arts Festival) at the Toronto Public Library this weekend (May 7-8th), where George and his work will be featured. Ottawa quill friends can come out to his talk on the Future of the Book at the CBBAG Book Show at the National Archives on June 11th. Thanks again to George and Michelle for a fantastic time! How did you spend May Day, quill friends? This entry was posted in Letters from the Porcupette (the Intern's Blog) and tagged Alice, George A Walker, interning, meetups, telecommuting, tipsheets, tom thomson, wood engraving. Bookmark the permalink.